We Are Proud to Announce Our Newest Medical Advisory Board Member! 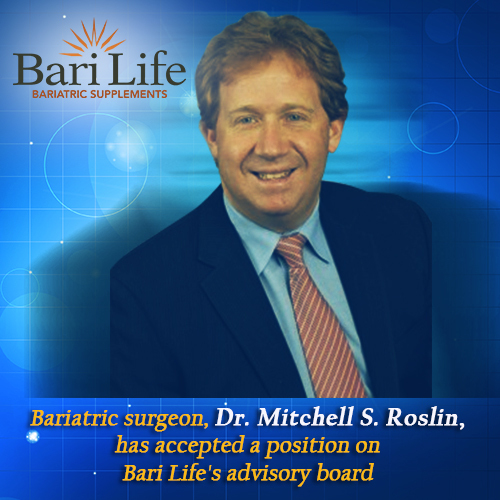 Internationally acclaimed bariatric surgeon, Dr. Mitchell S. Roslin, has accepted a position on Bari Life’s medical advisory board. Dr. Roslin is highly respected for dedicating his professional career to the treatment of morbid obesity around the world and in New York City, where he resides. He is President of Manhattan Minimally Invasive and Bariatric Surgery PC and he holds the position as Chief of Obesity Surgery at Lenox Hill Hospital in New York City. He is a faculty member at the Minimally Invasive Surgical Symposium, The Consensus Conference on the Sleeve Gastrectomy. He serves as the major teaching proctor for sleeve gastrectomy and duodenal switch and he is the course director for symposiums on revisional bariatric surgery. He is also the Editor of the VideoTextBook of Bariatric Surgery. Recently, Dr. Roslin served as invited faculty to give talks in Israel, Mexico and Europe. He is frequently requested by private bariatric practices across the country and around the world to teach surgeons new surgical techniques and procedures. Dr. Roslin is an innovator in the search for new and better treatments for obesity. Most recently he designed a method for the endoscopic treatment of relapse following gastric bypass. He holds several patents in the emerging field of Pacing Technology for the treatment of obesity. Dr. Roslin has expertise in duodenal switch and revisional bariatric surgery. He has been performing weight loss surgeries in New York since 1994 and laparoscopic obesity surgery since 2000. He was also a part of the LAP-BAND System clinical trial. In 1996, Dr. Roslin became the Director of Bariatric Surgery at the Maimonides Medical Center in New York City. In 2000, Dr. Roslin was appointed the Chief of Obesity Surgery at Lenox Hill Hospital in New York City and has supervised its growth into one of the most prestigious programs in the United States. Dr. Roslin was born in Brooklyn, New York. He earned his undergraduate degree at the University of Pennsylvania and earned his doctorate at New York University’s medical school. He performed his surgical training at Maimonides Medical Center in New York City. Founder of Bari Life, Dr. Stephen Boyce met Dr. Roslin through Ethicon Endo Surgery. Dr. Boyce and Dr. Roslin are surgical educators for Ethicon Endo Surgery and teach various courses on bariatric procedures across the nation. Ethicon is a world leader in the manufacturing and developing of innovative surgical products for laparoscopic and minimally invasive procedures.